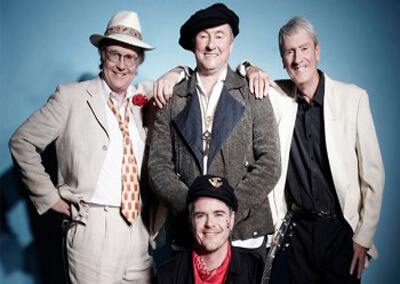 Sailor is a British pop group mostly famous in the 1970s. Much of the best material revolved around sailors’ adventures on shore leave, especially in the “red-light quarter”. Dressing in sailor gear that went with the image, they might easily be dismissed as something of a novelty act, but created some enduring and finely crafted pop music. The group’s leader, Georg Kajanus (stage name Georg Hultgreen), had previously had minor success as a songwriter, notably by penning Flying Machine for Cliff Richard in 1971 – though ironically it was Richard’s first UK single that failed to reach the Top 30. Another of the group’s trademarks was the ‘Nickelodeon’, a scratch-built contraption of pianos, synthesizers, glockenspiels, etc. that allowed the four-man band to reproduce on stage the complex acoustic arrangements that they had done in the studio. 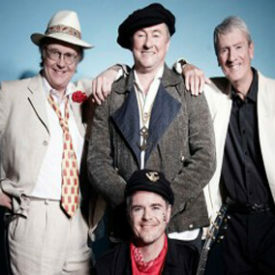 The group’s first British single, Traffic Jam , attracted considerable airplay on radio on release in 1974, but it was Glass Of Champagne , issued late the following year, which gave them their breakthrough in that country, reaching No. 2. The follow-up, Girls, Girls, Girls , also made the Top 10, though of their subsequent singles, only One Drink Too Many registered in the Top 40. The original line-up of Sailor split up at the end of the 1970s. Phil Pickett and Henry Marsh released more material as Sailor with Gavin David and Virginia David in 1980. Afterwards, Henry mainly composed music for television, Georg released three albums with “DATA”, Grant took up teaching chemistry, while Phil enjoyed success touring with “Culture Club” and co-writing the now classic hit Karma Chameleon . In 1989 a dream for Sailor and its fans came through: A new album, after a ten year silence, two new hit singles, The Secretary and La Cumbia , songs which are firm favourites at their concerts and which re-establish the band as a force to be reckoned with in the 1990s. They started touring again and performed at many TV shows and “Oldie Nights” from then on. In 1995 Georg Kajanus departed the band to pursue a solo career. The arrival of Peter Lincoln, a respected and talented guitarist and singer, gave new life to Sailor. Their first live album Live In Berlin was recorded in the new line up. Original member Henry Marsh left the band in 1999 and was replaced by Anthony England on the left side of the Nickelodeon. In May 2001 Anthony England left the band again to be replaced with a new passionate and talented musician, Rob Alderton. In the new line-up Sailor recorded their first DVD at a very special UK headline concert in November 2002. In 2004 Sailor were voted the 45th most successful pop band of the last 40 years in Germany, surrounded by Genesis on 46 and Culture Club on 44. Their first and only Sailor book A Glass Of Champagne – The Official Sailor Story with 352 pages and over 120 photographs (mostly unpublished) was released in June 2004. In July 2005 Rob Alderton left the ship. A few weeks later original Sailor member Henry Marsh returned to his place at the Nickelodeon. July 2006 saw the world premiere of Sailor, The Musical Journey at the Carnegie Hall, Dunfermline, Scotland. Written by Bill Blenman, the new musical was comprised entirely of Kajanus compositions and imaginatively tapped into Kajanus’ early 1970’s creation of sailors on shore leave and red light districts. The musical also featured two new, previously unheard compositions by Kajanus. In September 2006 Peter Lincoln decided to leave Sailor after ten years to join “Sweet” (band). Afterwards, Henry’s son Oliver Marsh joined the band as their new singer to continue the journey… And they are still sailing. In September 2006 the single A Glass of Champagne was used on a high-profile TV advertisement by Marks and Spencer.